In a local Sport store, you are often confronted with several choices to make: how does one know what is the proper model for them? At BATTRAM, we believe in offering a wide selection for each goalie, style, and level of play. Let's look at a scenario. Joe is a 36 year old hybrid style goalie and unfortunately has suffered a serious knee injury in the past, and is now requiring a knee brace during play. Joe plays once a week in a recreational level league. What pad would we recommend for Joe? We would recommend the Deceptor or Cyclone Models, for various reasons. Both pads are built with the same precision, quality craftsmanship and durable materials. Both pads also feature a user definable removable 3 knee-lift system to allow customized knee area sizing, additional cushioning with a forming fit for the individual goalie. Each of these models work well for stand-up and butterfly styles of play and have enough knee area flexibility to not add additional knee strain as can occur with some of the flat-faced pad models on the market. In Joe's case, by dealing directly with the manufacturer, Joe could easily ask to have further knee lifts added if required or other custom modifications that may be of assistance with his specific situation (ex) features to additionally reduce pad weight, discuss which models create the needed customization for the space which the brace requires, discuss what will allow the least strain at the knee area. This is a choice that would not be offered by most retail establishments without having to place a special order. As one can see, by dealing directly with the manufacturers of your product, the service and expertise you will receive is exceptional. Many clerks in stores simply have too many products to worry about, and therefore are not as knowledgeable as the person who is building your products. Ask us anything: this will ensure a proper pad for you. Now that you have decided on what model of goal pad is right for you, how do you know the proper size, and what is proper size? This is a sticky area. I like to define proper size, quite simply, as what the goalie feels comfortable with! 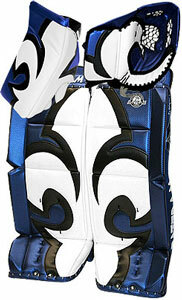 I personally prefer a pad that fits correctly from ankle to knee and centers my knee appropriately in the pad. They allow better mobility in the net without impeding movement such as what can occur when one adds too much height on the thigh rise area. For some women and smaller goalies, we recommend either our INT sized pads or SNR size models with a narrowed pad width to approximately 11" as this will allow better equipment control. The taller goaltenders can indeed use a full size senior pad. Once again, you can see why it is important to be able to be in direct contact with the manufacturer or a knowledgeable person, as each goalie is different and has different needs for their equipment. Not only will a proper fit improve your play, but also your confidence, control and comfort. Many companies offer a rough formula to achieve an appropriately fitted pad. We also have one, but would like to speak with each customer to recommend the perfect pad, and advise regarding custom options for sizing. While standing, measure on the right leg from the ankle bone to the center of the knee (where the knee bends) and from the center of the knee to the height where you like your pads. Your height, current pad sizing and model/manufacturer and preferred pad height are also important factors in determining an ideal fitting pad. We prefer to speak with each individual customer of Battram Goal Equipment to provide advice and direction for ensuring that your next set fits centered at the knee area and offers the height which you prefer without impacting or restricting mobility. Once again, a great opportunity to customize your gear for your individual and unique sizing requirements which may not always work with "stock" equipment from the retail shelf.